Jeff For Banks: Have we checked out of business banking? Alex Pollack, a resident fellow at The American Enterprise Institute, had a sobering editorial in the March 3, 2010 American Banker. The context of his commentary was on the bubble that burst in the residential real estate market, and the more methodical decline in commercial real estate. He rattled off sobering facts: fifty five percent of commercial bank loans are tied to real estate. For commercial banks under $1 billion in assets, the number jumps to seventy four percent (see chart). These statistics ignore the amount of real estate secured bonds and government agency bonds designed to fund real estate in banks’ securities portfolio. Clearly, commercial banks’ exposure to real estate contributed to the rising number of bank failures. What brought us to this point? Commercial banks were the connoisseurs of commercial finance dating back to the National Banking Act of 1864. That Act did not permit national banks to lend on real estate. The value of real estate was certainly more volatile then than now. Times changed, however, and banks were permitted to do real estate lending, and these loans became twenty five percent of bank loan portfolios after World War II. 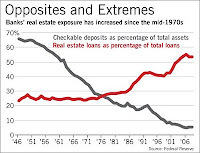 It remained at that level for nearly three decades when real estate lending began its meteoric rise to today’s levels. The decline in traditional business loans, in my opinion, was the result of two forces, one market and one not. The first was the government’s intervention in small business financing, beginning in the Great Depression through the formation of the Reconstruction Finance Corporation to today’s Small Business Administration. The second was large corporations gaining direct access to the capital markets, issuing short term notes and commercial paper instead of relying on bank financing. But we as bankers have played a role in the decline of business lending. Banks rely on collateral as a backstop for businesses that can no longer service their loans. Real estate has been a very reliable source of collateral. But the trend away from business lending will continue to lead to increased government intervention in free markets. According to the Bureau of Labor Statistics, service providing businesses are projected to grow from 73% of the labor market in 1998 to 79% in 2018 (see link below). Many if not most of these businesses don’t own the buildings where they operate. If a bank requires real estate as collateral, we may find ourselves unable to finance a growing economy. The government will increase its participation, picking winners and losers, and free markets will suffer.